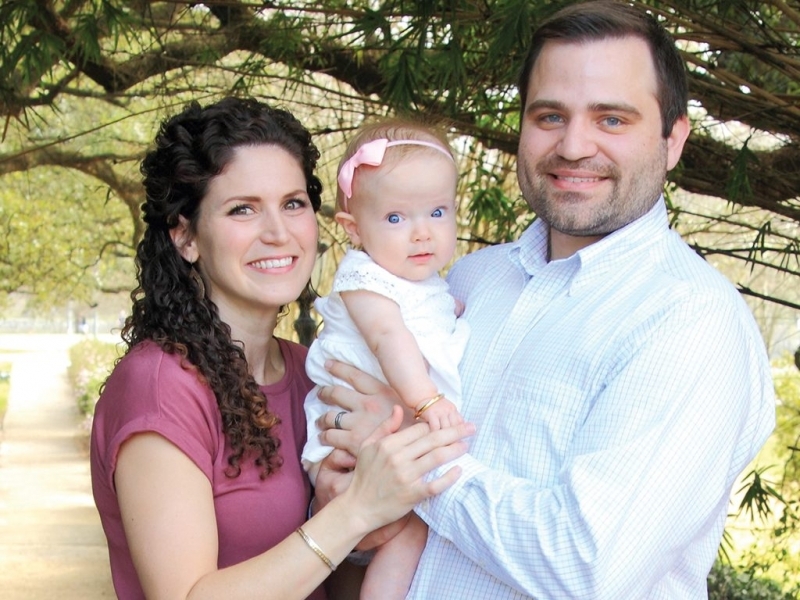 During the 22nd week of pregnancy, Beau and Sara Dantin discovered that their baby girl, Isabel, had a brain abnormality. The maternal fetal medical doctor confirmed that little Isabel had spina bifida, a diagnosis the Dantins were not expecting. “When we found out about the diagnosis, I had no knowledge of it before. I could tell by the doctor’s demeanor that it was serious, though,” Sara explains about the moment the couple learned the news. Beau, however, was familiar with the diagnosis, but was surprised and nervous for what was to come. “I knew what spina bifida was, but I had a lot of shock and a lot of fear. Everything seemed normal, and we had no history of any serious medical issues in the family. We didn’t know what to think. We were struggling, but we trusted there was a plan for her,” Beau shares. Isabel was diagnosed with Spina Bifida Myelomeningocele, one of the most severe forms of spina bifida in which the backbone and spinal canal do not close before birth. While many families are eligible to repair the defect in utero, the Dantins were not candidates because Sara had an anterior placenta. On July 26, 2016, Beau and Sara welcomed their first child via C-section, and three days later, Isabel went through surgery to repair her spine. Isabel was later given a brain shunt due to her Chiari Malformation Type 2 diagnosis. The family spent two weeks in the NICU before finally getting the chance to go home. Now nine months old, Isabel is thriving and always smiling. Isabel meets with Jill, her physical therapist, once a week at the Dantins’ home. “Jill works with her on her mobility, speech, and eating, and monitors other developmental concerns. She gives Isabel exercises and stretches to do, and she makes it fun for her. Jill has really normalized this for all of us,” Sara explains. While the Dantins have “seasons of good and seasons of struggle,” the family has remained positive, crediting Isabel and their faith in helping them get through the hard times. Doctors cannot provide an accurate picture of abilities or quality of life since spina bifida is considered a snowflake diagnosis, meaning the severity and impact of each person’s diagnosis is different, but the Dantins remain positive. They continue to encourage families who may be experiencing similar situations to find a doctor they are comfortable with, to not be afraid to ask questions, to not plan for the worst, and most importantly, to not let the disability define your child. We have been praying for Isabel and the Dantins from the first diagnosis in the womb. This family is amazing and have always trusted God for Isabel's healing. This article gives hope to others who may be going thru similar trials. Thanks for spotlighting this amazing story that is so inspiring. Isabel is such a beautiful child!